Before I get ridiculed to pieces, this is just an interesting idea I've had for a while. I have not looked in to the economics or cost feasibility of this so take it as it is. Every city must design its infrastructure around the topography it is encompassed by. It is often designed to accommodate the movement of people in an efficient manner specific to that cities needs. Some examples include the San Francisco street cars and the Vancouver water taxis. Both of these are quite memorable, unique to the city, and have helped make these cities much more walkable. Edmonton has the challenge of guiding people across the wide stretch of its river valley but it is almost always accomplished by car. Occasionally a very small number of people will commute to work by bike. But it is extremely uncommon for a person to walk to work from the Old Strathcona area because it is simply too far. Is there a big enough population for this? Would people be willing to pay to use this? Somethings could be included to increase the demand of this. For instance, attaching bike racks so people using their bikes could use this as well. Also, a bus stop or two nearby couldn't hurt either. Anyways, just a new idea (I think). Or we could always just fix more potholes. Downtown-Whyte Ave gondola? Sounds like a nice idea to me! i got 6 bucks that says gondola on it! I floated the idea of a gondola on the High Level Bridge when I joined this board. Take if from City center mall to the heart of Whyte. ^Yeah I like those locations. Although, it would be nearly impossible to put the north end station anywhere but on the edge of the top because of the towers there. Isn't the river a bit rough? Just kidding. Something across the river might be interesting though, although we do have the high level tram already, but that misses the main part of downtown. Last edited by moahunter; 30-10-2009 at 04:49 PM. If it is feasible this is a fantastic idea. Not sure where it would be reasonable to have it downtown though. There isn't really a lot of open riverbank real-estate on the North side unless it's run right into The Quarters and we hope that project finds some legs. As for the South, if the city has no plans for the park on the east side of Gateway Blvd (where the caboose is, I have no idea what it's called) I'd say have it run right through there so it would end closer to Whyte Ave.
Great idea. It sounds like a lite version (no, perhaps not lite, but a different form) of what Portland, Oregon already has. They have an aerial tram that connects to a major new condominium area at the end of the streetcar up the vast hills to a university. It serves as a commuting service as well as a tourist attractions as you get great views of Downtown from it. Could be very similar with Edmonton's, but instead of going up(/down) a hill, you'd be suspended across a Mighty valley. Going from Whyte Avenue to the Legislature then west to 104 St and Jasper or 101 St and Jasper would be a great idea IMO. Not to mention is more touristy than viable transportation, whereas this one would be both. And it's closed for the majority of the year. No ridicule from me, ChillNU. I think it's a great idea. Or how about PRT across the High Level? For anyone not involved with or familiar with it, there was a previous highly fractious thread proposing PRT (Personal Rapid Transit? ), and one of the suggestions was PRT across the High Level Bridge. I'd link to it, but it's very long, and I couldn't find the specific page. I think it's certainly an interesting idea. I've heard all kinds of "crazy" (as in well outside the box) ideas with this same aim, including things like escalators/moving sidewalks, and even "the hanging gardens of Babylon" in a Downtown Plan Review brainstorming session, that features some sort of transport mechanism. Better bus service from Old Strathcona to Downtown might be a start on this problem, but it seems you may be looking for a more exciting, innovative, attention-getting, and elegant solution. Interesting. for sure. Last edited by Jimbo; 31-10-2009 at 08:40 AM. Like someone already pointed out, Portland already has one...no reason we couldn't do it - our river valley is an ostacle sometimes, if there is a connection that needs to be made that isn't' being made already. It would be very cool, especially if we ever get a high-speed train to downtown that would stop the streetcar over the highlevel from running anymore. Anyone know how expensive these kind of things are? That's a good idea I think Jimbo, better than the gondola. PRT would probably be equally "fun" and a good way to test the concept (issues like security would be well considered linking these areas) on a manageable scale. It could run say, down 102, over the high level, and perhaps stop at whyte (not sure if shop owners would want those "thin" elevated guide rails down whyte just yet). I don't want to get into a PRT discussion, it's just not what I think we should be going for. 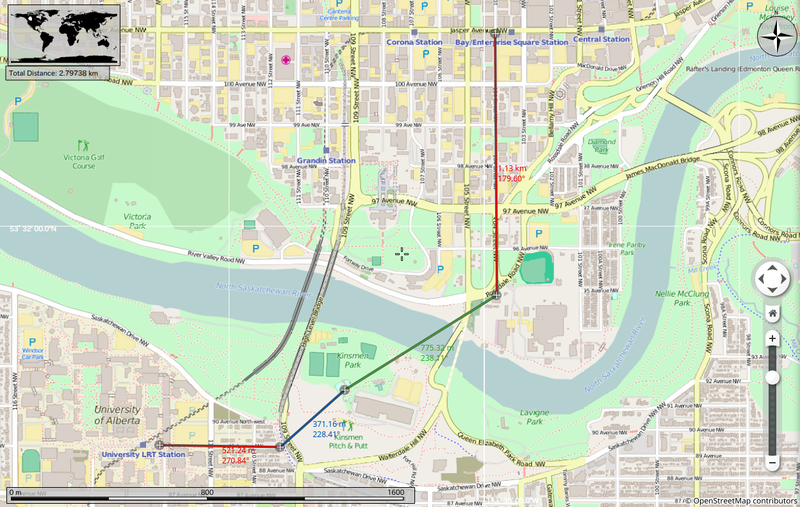 I think having the gondola/tram cross the River valley around 106 or 107 St would be good, as it'd be enough distance from potential Calgary Trail bridge, but further away from 109 St. Plus it could spur development on the southside of Whyte Avenue between 106-108 Streets. Yes, I would support to see something like this in Edmonton. Would be very cool to see. Personally I like the idea from end of steel park to the SHAW conference centre/LMP. ^ Yeah I would think that would have to be the best area to have it. I think enough people have said this sounds like a good idea, so I'm passing it on to someone in government who could do something about it. More constructive criticism would be good too, thanks everyone. every time I think of this I get a vision of a gondola not crossing the river valley, but following the river valley. Think of the views one could get! although if done poorly it would be an unsightly blight on the beautiful river valley, not to mention it would be pretty expensive and probably underutilized. That would be awesome but probably too costly, too slow, and I don't think people would use that on a regular basis... perhaps when Edmonton is much more dense in more areas. ^It would be nice to look from, but would it be nice to look at? I think something within Edmonton might be neat, but once you leave the City, sort of nice to leave the River untouched. Are we talking about something like these??? I will take a 100% pass on wires and towers in the valley ! Those are nice, but I think they're a little small, I like the amount of glass though... I had imagined something with larger capacity and cubical but those could probably work. What city is that by the way... Santiago? ^Why are they so close together? Wouldn't that spoil the view? I love the idea. I think it would be wonderful. The view is pretty nice. Interesting notion, chillNU. This could tie in with some of the Expo planning. What would you think if it wasn't a single span but instead something that stopped in Rossdale, perhaps at the decommissioned power station? Looks like about 2km from the End of Steel Park on the South Side to the Hotel Mac. 3) geotechnical stability of the slopes at either end: our sandy banks must be heavily stabilized to bear loads of any significance - not sure what kind of a factor this would be. Anything's possible, but cost and risk are the issues. 4) the sag: is there enough height difference to accommodate the sag, particularly of the long span (no stop at bottom). Whistler looks like maybe an 8 to 1 sag (here: http://ww1.whistlerblackcomb.com/p2pg/details/) so a 2 km span might have a sag of 250m. Valley's about 60m deep. So you'd need some towers. eliminate the sag and use some signature towers in doing so - the taller the better! they should be "celebrated" if done "right" without trying to hide something that can't be hidden: even though this is a bridge, it illustrates the principle. and i agree with the original poster's comment on the images of the cars posted above that they're too small. if they can't accomodate 6 people you will cut off too many of the family and visitor groups for the system to do what you want it to... i also think they should kept large enough to accomodate wheelchairs, segways and bicycles as well as someone carrying a set of cross country skis. Thanks Mr. Iveson, I appreciate your insight. Thanks for taking some time on this. I like that idea of it stopping at Rossdale, it could potentially address some of the questions you posed. -where would it encourage the most amount of people to use it? The sag - I'm not sure that the sag would be of quite the same proportion as the mountain. If they had not had the size of a valley that they have, maybe they would have reduced the amount of sag if that was possible. That being said, I'm not opposed to a couple towers. Cost Effectiveness- Do you think there would be a big enough market for this to be feasible now or in the future? How much money can the city justify spending on a project like this... if it does tie into the Expo, I would assume significantly more. Also, it seems that unique projects often receive private contributions. I feel that private investment could finance a portion of this. Is this a reasonable assumption? I like the idea of having a "signature" tower. I strongly feel that it would have to go from the top of one bank to the top of the other. it has to bridge DT with whyte. ^ I think that is still the idea... but a stop in the Rossdale area could be possible..
^How? You are going to send it down the hill, then up again? Wouldn't a high crossing give a better view (and better link downtown to the South)? you would have the same view from either bank to the first tower (and between any additional intermediate towers) and then you would drop down - say to rossdale or fort edmonton or wherever depending on the total route - before moving back up to the next tower (and between any additional intermediate towers - where you would have your same high view back again... as for the "better link to the south", these are not commuter/time sensitive trips - they are destination/activity oriented trips where the experience will count for as much as the efficiency much like one's holiday road choice to take "the scenic route". ^I see what you mean. As to "better link to the South", I was thinking more in terms of if it was only from Rossdale to the South. I think it needs to go from the heart of downtown (be it "as well as Rossdale", or on its own) as that is where the people are. I guess a link from Rossdale to downtown might actually pick up some "commuters" as well - i.e. people who live in Rossdale, but work downtown, or similar. -Is it primarily for commuter use? If so, what are the logical points to connect? How will people connect to it at either end if they are not within walking distance to begin with? -Is it primarily for tourist use? At What times of day? Does improving access to the river valley for tourists (and secondarily for citizens) have value? There could be a business case for it, but it strikes me this is something like the water taxis in False Creek Vancouver: used by some commuters, sustained mainly by tourists. This idea is nowhere on the city's radar, and I'm not sure it would move ahead of the existing long list of infrastructure priorities without a strong case and a tie in to something like Expo. This might make a neat Pecha Kucha presentation for someone to put together to get people excited. Last edited by Don Iveson; 05-11-2009 at 10:47 PM. we do not have a large enough tourist base for this IMO... and I agree this should not be on the radar unless something of an Expo or the like were to be secured. True. Although I love the idea the cost towards this verse what we get out of it is most likely not worth it. ...although we do have 1,100,000 people who might be interested in this. I understand the city has much more important priorities, especially when it comes to transportation concerns - LRT expansion needs to be completed quickly. Also, at this time it may not be too feasible, given our relatively low tourist numbers, low density etc, etc. I think this is something they can look into doing when they build the Millwoods LRT extension across the river. Current plans call for this crossing to be at the pedestrian bridge by McKinney Park. Also...if they're going to build a funicular between Jasper Ave and McKinney Park then maybe the gondola is the way to do it? My first preference is still along the High Level Bridge. Sorry... but it makes no sense to have it along the High Level bridge. -there's already that street car that runs on top of it during the summer. It wouldn't provide anything that isn't already provided from existing infrastructure. Near 104th/105th there are none of these things, it is much better suited around this area. It wouldn't be of any benefit near the High Level Bridge. If it's from Sask Drive to a redeveloped Rossdale plant site then I can dig that too. I agree. I think it would have a very similar customer base to that of the High Level Streetcar. Mostly residents of the city who are looking for something different, or a taste of history, or are simply exploring the city in which they live. Granted I don't know much about the actual ridership on the streetcar and how many tourists they get each season, but I think that it would be something to look at for comparison's sake. and I agree with IanO that this probably shouldn't be looked at until the city secures Expo 2017, and it should be built in conjunction with that if anything. does $2.35 billion sound much worse than $2.3 billion? As long as it's tied into Expo, and we haven't got it yet, couldn't a separate line from Rossdale up to the city centre be installed in addition to a one-shot, across-the-valley line. A separate Rossdale line would, of course, be contingent on what that area is used for after Expo has gone. To be solely for Rossdale commuter traffic I don't think would warrant the expense of a dedicated line down there. I'm not keen on the idea of starting a ride out of city centre to go to Whyte, then having to drop down to Rossdale and then be hoisted back up to continue. Last edited by howie; 03-12-2009 at 01:50 PM. a 2 line system would be ideal, but anything more than that would be too much interference in the view of the River Valley I think. Imagine how sweet it would be to head out for an Edmonton Capitals game and take the River Valley Gondola from downtown (or Whyte) to and from the game. Any thoughts for a line from the Muttart Cinservatory to Louise McKinney Park?? I agree especially that if something like this is to be implemented, it would have to link the CBD and Old Strathcona. 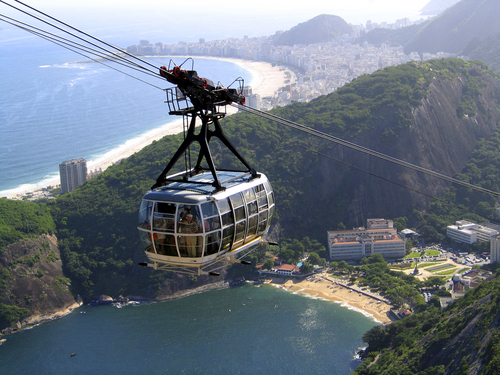 I was excited to see that the city was considering an "aerial tram", but dumbfounded at the location they proposed, hopefully this could be adapted with a little persuasion. I still love this idea. Connecting End of Steel Park (Old Strathcona) to Rossdale (Expo site) to the North bank of the river (downtown) is brilliant. I'd like to see the north tower built right at Telus Plaza. They would probably even be open to buying the naming rights of it (thus reducing overall costs). 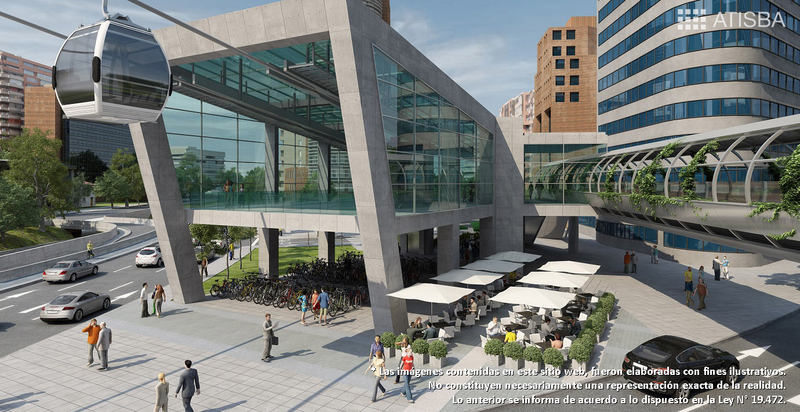 This would connect the LRT (Central Station) to the Gondola (Telus Station?) to the River Taxi at Rossdale going to South Campus (other Expo site). Maybe Epcor would even pay for naming rights for the Rossdale stop? I still think this is an excellent idea as well, and should be proposed to the EXPO bid committee. When imagining a route for this gondola to take, keep in mind that these things only really have the ability to make a straight run (unless you duplicate all the infrastructure to power the cables etc.) This means that unless your stops or stations are in alignment, costs will be way out of proportion to benefits. From a purely utilitarian perspective (ie ridership over spectacle) creating a link between CBD and Strathcona is better managed on the ground. This allows the opportunity for more stops (read: increased accessibility), bringing people to the Rossdale flats (creating development potential) and closing the public transit gap between the 2 commercial zones. This truly is the forum of "hey, imagine if there was no such thing as a limited resources or budget." ^ At least we have imagination. I have imagination. However, I am realistic about what I imagine and try not to get excited about things that are unnecessary and will take money away from something with more practical value. A person with some imagination has an idea. The idea is shared, vetted, investigated. If the idea is good, it is pursued. If not, it is discarded. If the good idea is possible and has public support it is considered by the city after some lobby. If the good idea with public support fits into nto budgetary priorities, it is implemented (EDIT add) but after rounds of debate, studies, and consultations. So what is the problem with having a little bit of an imagination? Last edited by grish; 25-09-2010 at 06:03 PM. I think that is mighty presumptuous. Plenty of terrible ideas out there. Or are you suggesting that everything that has happened is a &quot;good&quot; idea? I know that sounds overly broad, but that is what you are saying there. I would argue for an idea to be good, it would have to be possible. Otherwise maybe its neat but impractical? And ideas come in without public support. Although I suppose I am assuming you mean widespread public support and maybe you don't. Not always. Well, unless you can find some studies done on Bylaw 14547. That one sticks out in my mind as a really poorly thought out Bylaw. Never claimed there was. Since that isn't an argument I made, so why are you asking me that question? I mean, other than to try and control the debate with strawmen. the presumption is that I asked YOU and that it was an actual question, not a rhetorical one. The other presumption being made is that the idea is funded, built and run by the city when it can just as well be a private venture. We already have the radial railway society running historic streetcars over the top of the high level bridge. Wouldn't a gondola be needlessly replicating this service? I took a ride on the Osaka tram last summer. Very cool! I'd rather see this service expanded and promoted, rather than untold millions spent on creating a gondola. If your argument is that it's not practical enough, then there's the #9 bus across the high level and into downtown. That's plenty practical. Last edited by kmusky; 25-09-2010 at 11:18 PM. What you consider to be of "more practical value" isn't going to be the same as what others think is of practical value. Realism is great and all, but realism doesn't really have much to do with imagination. Realism doesn't dream big. I often don't think it dreams at all. In any case, your complaint is really pointless. It doesn't cost you or anyone a cent to imagine, dream, and talk about an idea in an online forum, practical or otherwise. From my experience of Gondola's in other cities, including tourist towns where there is a high demand, it will not be financially viable on its own as a private venture. My biggest fear with this idea, like others of similar nature, is that people will ride it once, go "great", then never use it again. Especially if the downtown LRT connector ever gets built out through to Whyte. In writing that, Edmonton has so few unique attractions, maybe it would be worth it. Well, my answer is nothing is wrong with a little imagination. The implication from the context in which the question was asked is that I was somehow suggesting that a little imagination was made. Either that or you just randomly throw out irrelevant questions. What you consider to be of &quot;more practical value&quot; isn't going to be the same as what others think is of practical value. Of course. People have different opinions. I disagree. Realism tempers imagination into something more productive. No more pointless than imagining, dreaming, or talking about an idea in an online form. 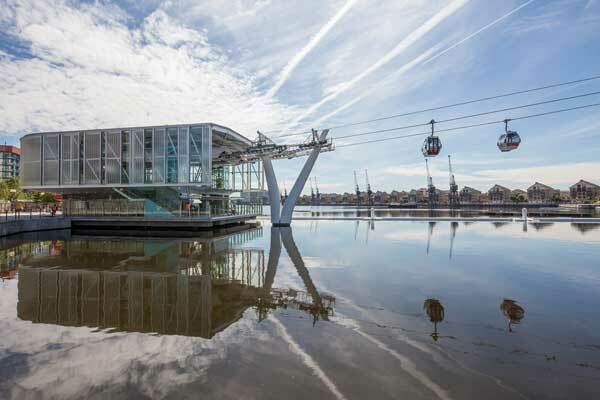 From my experience of Gondola's in other cities, including tourist towns where there is a high demand, it will not be financially viable on its own as a private venture. My biggest fear with this idea, like others of similar nature, is that people will ride it once, go &quot;great&quot;, then never use it again. Especially if the downtown LRT connector ever gets built out through to Whyte. Why make something just to have a "unique" attraction? And from the sounds of it, a gondola wouldn't be unique to this city anyways. irrelevant questions vs irrelevant posts makes for a pretty irrelevant discussion. Then feel free not to engage next time. Why not point out the flaws? Or do we have to wait till someone brings it before city council before we are allowed to do that? the idea in this criticism is secondary to the flaw in the people having the ideas. Want to describe the idea as financially bad–go for it. Just don't drag the people down. Hence is the distinction between having an imagination to propose ideas and actually practical ideas that could be implemented. One is either a subset of the other or an intersection with the other. That is fair comment. I touched on part of my underlying criticism but I did focus too much on my general annoyance with these kind of ideas (because some do get implemented...remember the singing bins asking you to recycle?) Anyways, I don't think there is demand for it and it would likely be costly. While the river valley is very nice I don't think a gondola ride across it will bring in repeat users (or even many first time users) from either inside or outside the city. I could be wrong, but I invite someone to provide a study of the issue otherwise its battle of the anecdotal evidence. Nor can I think of a place where foot traffic on both sides would make it useful for normal transportation where there isn't already a method of crossing. I think that is a stretch to try and turn my comment into a general condemnation of imagination. It is a condemnation of imagination not tempered by reality but put forth as an actual solution. I mean, bringing dinosaurs back from the dead and having a park here showing them off would be a great way to drum up tourist business etc..etc... but I don't post the idea here because I know that its inherently unrealistic. Unfortunately, I find hoping to be overrated generally. glad we can agree on most of it. you cannot have ideas that are known to be financially viable from the start. They are ideas born out of imagination. As you've suggested, studies need to be done to check whether an idea is worthy an investment. Where would the study come from? There needs to be some measure of belief in the idea before a study can be done. So, are you now suggesting that the gondola idea is at the very least worthy of a study? Then it couldn't all that bad, could it? Not as an idea anyways. you cannot have ideas that are known to be financially viable from the start. They are ideas born out of imagination. Well...some things are more easily categorized as financially viable than others from the start. Further, there is a personal vetting that can be done. As you've suggested, studies need to be done to check whether an idea is worthy an investment. Where would the study come from? There needs to be some measure of belief in the idea before a study can be done. Nope, I don't think it is. I think it would be surprising if it got to study stage. However, if someone kept pushing it for whatever reason I'd place my money on a study (as proper as a study can be...which is another issue) shooting it down too. However, I also acknowledge that I could be wrong and this could be a great idea. I would be shocked, but there you go. That isn't a vote of confidence though. I also acknowledge that there could be an invisible intangible and otherwise undetectable unicorn sitting right next to me at the moment. Flex Montallo, I appreciate your concerns in this discussion, but I'd caution that you're perhaps being presumptuous yourself in your condemnation of such an idea at this (early) stage. There are people within the city administration (as well as council) that are quite keen on just such a possibility of a river-valley gondola, or similar. Additionally, while still in an early stage, a design consultancy within the city has been contacted to study different means of mechanically moving people from the downtown core down to LM Park (and potentially other river valley sites). Of the three options currently outlined, one is in fact an aerial tramway. So yes, it absolutely is/will be moving towards the study stage. In due time, we'll have more public details and can better argue the merits of such a proposal. Until then, it's really just idle speculation. Well, in my experience, that actually validates my early condemnation. Additionally, while still in an early stage, a design consultancy within the city has been contacted to study different means of mechanically moving people from the downtown core down to LM Park (and potentially other river valley sites). And this kind of expenditure on consultants, which the city itself has admitted it is addicted to in a bad way, is why its important to shoot some of these things down early. Of the three options currently outlined, one is in fact an aerial tramway. So yes, it absolutely is/will be moving towards the study stage. A thing I will be shocked to find out we need or want...however, I imagine the consultant will find so given either the terms of reference they are working under or other factor (of course, maybe not). Fair enough. I do question the value of some work done but you are right, until its actually prepared it will be hard to attack the methodology the work done. However, I still think the idea is so fundamentally flawed that I don't need a further report to criticize it. This is such a waste of money when we already have a mechanical means, being the escalators in the Shaw conference centre. It isn't access that keeping people away from this park, it is fear of the inhabitants (which is less of an issue when its busy during weekdays). ^I guess LRT is a waste too when we already have buses? The Shaw escalators cover about half the vertical drop to the bottom of LMRP, where the bathrooms and retail bays are located. I found an interesting site put together by someone in Toronto. 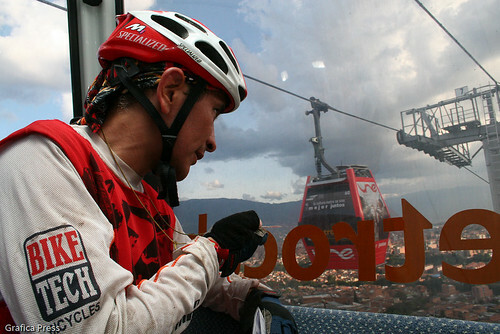 I was wondering about taking a bike on a gondola. I guess this pic from Medellin helps answer that question. Its an incredibly easy walk, the escalators cover the "worst" of the hill. The issue isn't access, the issue is that there is nothing at the bottom that's worth going to. Put something interesting there, and people will go there. At the moment though, the image in most people's minds is of the aggressive homeless they have seen down there. Notice that LRT actually tries to connect interesting places though? I think the river valley gondola could perhaps work as it could connect downtown and whyte in an interesting way. Well, then either the river valley is an uninteresting place, or you've just contradicted yourself. I wonder, for Expo, if something along the lines of motorized golf carts or community shuttle buses might work. (1) One line from Strathcona, along Walterdale/Gateway, to Rossdale (Telus Field). These shuttles could use the multi-use trail, if one is built alongside. (2) A second line from Rossdale to 107 Street Transit Centre/LRT connector. 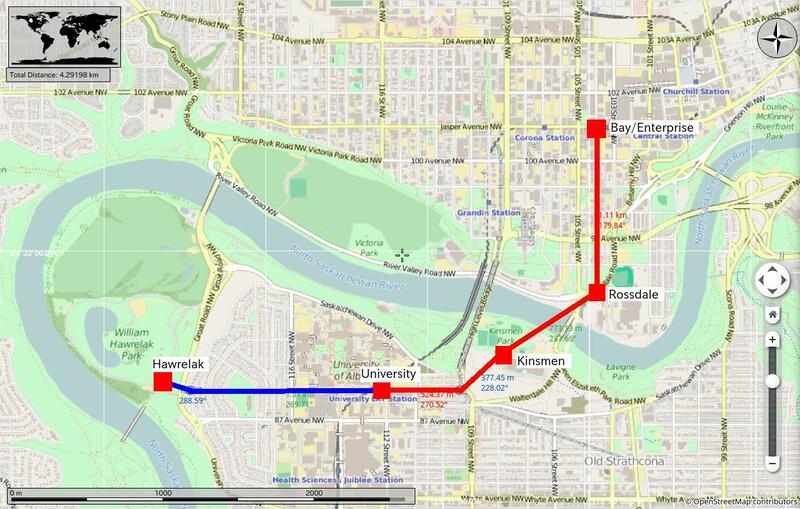 (3) A third line from Rossdale to SCC, possibly crossing the SE LRT bridge to Muttart Station. (4) A community bus/shuttle from Muttart station travelling along the James MacDonald Bridge to Rossdale. At Kicking Horse in Golden you can fit two mountain bikes and people in each cabin. There's a specific way to load them since the bikes themselves are longer than the cabins are wide, but once you've loaded em once it's pretty easy. Last edited by B.ike; 01-03-2016 at 11:22 AM. Love it. Only concern is how that would affect the Rossdale revitalization plans. I believe a condo is planned for at least one site you've got mapped out. Yeah, I think that second support tower from the Jasper Station is where the Bellamy Hill Condo tower is proposed, no? Awesome idea though! I'd definitely be behind this way more than the current proposal. (Even though, call me crazy, but you could have both... They kind of serve different areas of the river valley). I love the idea of a gondola for the next project. Integrates with the LRT at both ends. Could probably build the University-Kinsmen link immediately, while ideas for Rossdale stew. Last edited by JayBee; 01-03-2016 at 01:40 AM. I think that a well designed line from DT to Whyte is a great idea and would be heavily used. The CEO should allow open proposals to private companies to finance build and operate, entirely separate from ETS, with a subsidy based upon ridership. The subsidy could be funded by savings of reduced demand for ETS in the area. Will this ever see the light of day? IMHO, No. ETS and the Transit union would never let the project come before Council. Not sure if this is been posted before but this is a good look at what could be. I think it may be a little far fetched but i love the principles. I wish Edmonton would step out and take risks more often. I think "urban cable" is the ideal solution to our transit and active transport issues in the core. I think that a downtown to whyte "urban cable" link would be among the most utilized of any public transit project in the city. It would have enormous implications for development and business growth. Imagine linking our two entertainment districts with one seamless transition. A night out would never be "whyte or downtown" again, both would be considered functionally the same destination. Commuting would be made simple for pedestrians and cyclists who can simply hop on and off without worrying about hills. Rossdale would be fully connected to the rest of the city, allowing for development opportunities that aren't car-dependent. And if we are going off of what other places have done, it could probably be done for around the same price as our funicular project. To me, this is an absolute no-brainer. Do we want a glorified escalator and pedestrian ramp, or do we want a project that would change the core of the city for the better in a very fundamental way? Last edited by Jaerdo; 01-03-2016 at 11:46 AM.